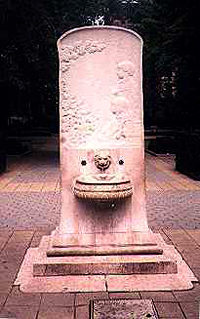 The Slocum fountain in Tompkins Square Park. See a slideshow of more city memorials. The worst disaster in New York Citys history before last years attacks was the 1904 fire aboard the excursion steamer General Slocum. The ship was taking the congregation of St. Marks German Lutheran Church for a trip up the East River when it caught aflame. The blaze killed at least 1021 people. Their memorial is a small pink marble fountain in the East Villages Tompkins Square Park, inscribed, "they were the Earths purest children, young and fair." In contrast, a massive monument to the 258 American sailors who died when the battleship Maine exploded during the Spanish American War rises imposingly at the Columbus Circle entrance to Central Park. Atop the tall monument, commissioned by public donations to William Randolph Hearsts New York Morning Journal, three seahorses pull a woman in a seashell chariot. The figures are cast in bronze from the sunken ships guns. In creating these memorials and others throughout the city, New Yorkers grappled with how to commemorate heroes or tragic events, and often came to very different conclusions. The current talks about how to memorialize the World Trade Center attacks are "not a new discussion at all," said Robin Lynn, director of tours for the Municipal Art Society. "Every memorial in the city had to start by asking the question, what is appropriate?". Lynn has planned a series of two hour walks surveying some of the over 2,000 statues and monuments in New York City's public places. They include a stop at the showy Maine Monument, but not the humble Slocum Fountain. Lynn said that she decided to create the tours because New Yorkers preoccupation with a memorial for the World Trade Center seems to be "in the air." "This is something that is on peoples minds," added architectural historian Francis Morrone, who will be leading several of the tours (see the society's web site for a schedule). "I think just about everybody wants to make sure that we do this right." He said that the walks will be a way for people to see a wide range of city memorials and decide for themselves whether or not they are relevant to the citys newest addition.